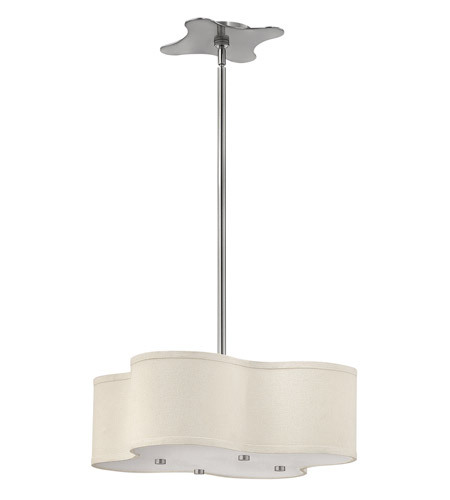 Q RE: Cirrus Category Foyer Pendant SKU	3804BN UPC	00640665380408 - Can these be mounted from a slanted ceiling? A The Hinkley Lighting Cirrus 4 Light Hanging Foyer 3804BN has a swivel on it to hang the fixture from a sloped ceiling. Q what is the drop from the ceiling? A The Hinkley Lighting Cirrus 4 Light Hanging Foyer 3804BN includes (1) 4", (1) 6", (1) 12", and (1) 24" stems to allow for adjustable mounting heights at the time of installation. Q Can this light be mounted flush to the ceiling? A The Hinkley Lighting Cirrus 4 Light Hanging Foyer 3804BN cannot be flush mounted. This fixture comes supplied with (1) 4", (1) 6", (1) 12", and (1) 24" downrod. For minimum height you can use the 4" downrod and it will be like a semi-flush fixture.